From the desk of Jedd Johnson, world class grip strength competitor, professional strongman performer, and former wrist pain sufferer. My name is Jedd Johnson, and my wrists have taken a beating. 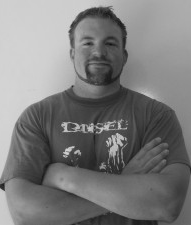 I am a Grip Sport competitor and performing Strongman. I push my hand, wrist and forearm strength to the limits by lifting odd objects, bending nails and ripping phone books and playing cards. However, all of this high-intensity training for my lower arms is not what originally brought on wrist pain for me. It was much more traditional training that first made me experience wrist pain. I got my start like many people do. I would go to the grocery store and stop at the magazine stand and check out all the bodybuilding magazines. Naturally, I thought everything in those magazines was the gospel as far as putting on muscle was concerned, so I followed everything I read to the T.
This led me to trying exercises such as Barbell Curls and Upright Rows, because the two things I wanted to pack muscle on the most were by arms and my shoulders. Unfortunately, after a few months of Barbell Curls and Upright Rows, my joints were already beat up. I couldn’t figure out how the guys in the magazines were able to stay in “the game” for so long, since the same exercises they were doing were causing me so much pain. In a short time, it felt like I had either broken or dislocated something in my right wrist from performing Upright Rows each week, and my left wrist felt like it was on fire every time I performed the Barbell Curls. I finally quit doing Upright Rows altogether and replaced Barbell Curls with other exercises, but it still took several months before the pain went away in my wrists. These days, I am much better at listening to my body when I train and have gotten very good at protecting my joints and preventing injuries. However, I know there are many of you out there who still experience wrist pain every day of your lives. Your wrists hurt when you drive. Your wrist crack when drink coffee or eat your lunch. Your wrists ache when you try to relax or fall asleep. I bet sometimes it seems like even the smallest and simplest tasks bother your sore wrists. Recently, I reached out to my friend, Rick Kaselj. Rick has quickly become the go-to guy for people who are serious about their training because he helps them get out of pain and get back to training the way they want to. Since so many people like you have contacted us asking for help with fixing wrist pain, Rick and I have teamed up to produce Fix My Wrist Pain: 30 Days to Stronger, Healthier, Pain-Free Wrists. Goal #2: To help you stay in “the game” for as long as possible by preventing your wrist pain from coming back. In this component, Rick will show you what you need to begin doing to get rid of your wrist pain for good. Rick has put together a straight-forward guide where he will identify the potential causes of your wrist pain, and how to go about rehabilitating it. This will be just like you’re in an appointment with your Virtual Pain Therapist, Rick Kaselj. As he takes you by the hand and explains everything you need to know about wrist pain, you will begin to understand all the components of the Fix My Wrist Pain Recovery Program. Rick will take the time to explain things in a way that you will understand and show you want you need to do, to get the most out of the exercises. You’ll be on your way to relief. With the Rehab Techniques laying down the foundation to your recovery, now this is where doing the right exercises, in the right order, at the right amount kicks in. 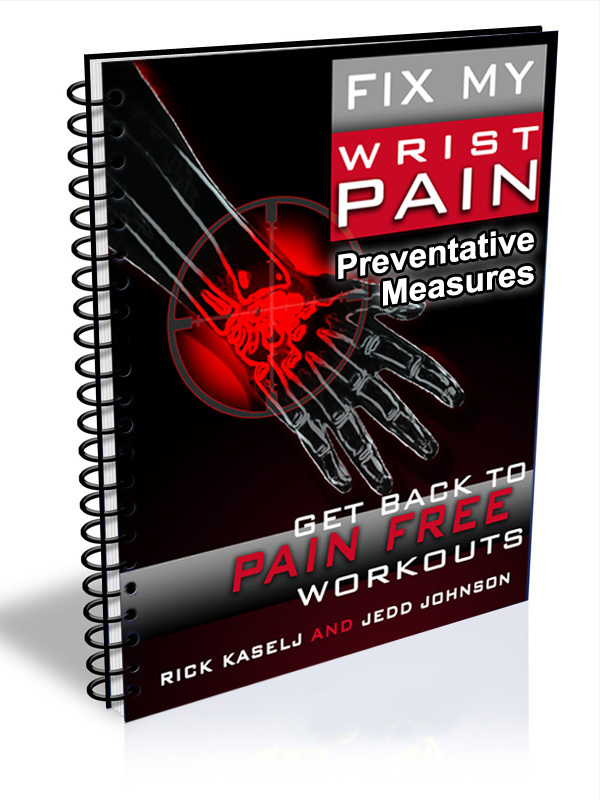 Rick will give you the exercises that you need to do in order to overcome your wrist pain. He shows you the exercise, describes the exercise, tells you how to progress it and the order to do things. The exercise require minimal equipment and can be done anywhere. In this section, I cover my best wrist pain preventive strategies. Mindset: You will begin to develop a new mindset to keep injuries from taking place. Warm-up: You will learn how to prime your whole body for training in order to keep your wrist resistant against injury. Flexibility: You will come to understand how to keep your wrists limber and tough by stretching. And you’ll know when you should stretch to meet your individual needs. Mobility: Without proper movement quality, you can’t train how you want to. You’ll see how to keep your wrists mobile and working right. Plus, you’ll learn 3 other body parts that can contribute to your wrist health, that you aren’t even aware of. Strengthening the Wrists: Strong Wrists SCOFF AT INJURIES. I will show you my top exercises for building wrist strength, and soon your wrists will be reinforced against pain and injury. Other Top Secret Preventive Methods: Being a Grip Athlete, I’ve learned many alternative methods for keeping the lower arms injury free. And soon you will learn them and know how to put them into action to reinforce your wrists. Never Skip Workouts or Exercises Again. Use these WORK-AROUNDS Instead! Over the years in dealing with my own wrist pain, I have developed ways to modify exercises to make them safer for the wrists. And I want to pass these on to you so you can have Pain Free Workouts! Bench Press: Get ready to set new personal bests on the bench, because your wrists aren’t going to hurt anymore once I show you this one small technique tweak, plus you’ll finally learn how to wrap your wrists right for bigger lifts and a more stable grip on the bar. And Many More… I’ve only scratched the surface. This component is over 50 pages and I will show you more than 25 exercise modifications for the lifts that cause your wrists the biggest problems. Get ready to get strong on lots of lifts again. It will be like peeling 10 years off your body’s injury clock. Click HERE now to order the Fix My Wrist Pain System for $39. When it comes to training with weights, whether you are doing it simply to look great, to help you perform better in sports, or if it is just your way to stay healthy, the wrists are going to play an important role. Let’s face it, the wrists are involved in ALMOST ALL of the exercises we do in the gym. The wrists are a major factor in any kind of exercise where we are pulling, such as Deadlifts, Rows, Pull-ups, Chins, Curls and Pull-downs. The wrists are involved in exercises where we must push, such as Bench Press, Shoulder Press, and Tricep work. And even if you don’t use weights, the wrists are important to bodyweight supporting lifts like Dips, Push-ups, Burpees, and Hand Stands. Even in exercises such as Squats, where the barbell rests on your upper back, the wrists are still important to help keep the bar right where it needs to be. In any of these lifts, if your wrists are sore, you are going to feel it, BIG TIME. When your wrists are bothering you the weights you lift will be lower and the number of reps you do will be reduced. All of these things limit the results you get from your training and keep you from accomplishing your goals. And that is why now is the time to pick up Fix My Wrist Pain. But sometimes, the pain is not so severe that we have to limit what we push and pull. Sometimes, the problem is just the lingering thoughts in the back of our mind, where we just can’t stop wondering IF this exercise will hurt. Or IF the wrist is going to affect me. And it might not even be in the weight room where the nagging little spot in the wrist might act up. It might be when we’re opening a door, or when we’re typing an email, or when we’re taking a sip from our coffee mug, or even when you are making love to the person you love. Helping to FIX all of this is why I have teamed up with Rick on this project. I know what it’s like to have seemingly everything in life affected by nagging wrist pain. 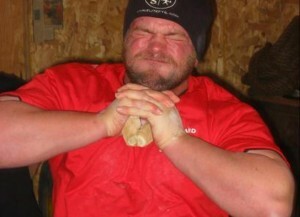 Fortunately, through years of trial and error, I have finally beaten my wrist pain problems and I have been able to once again perform at a high level, both in Grip Sport competition, and in front of large crowds as a strongman performer. And now I want to share the keys to ending wrist pain with you so you can get back to doing the training you love. Many people can hardly believe the amazing difference they see and feel in their training, sports, pastimes, and life in general, once the nagging ache that comes with wrist injuries and other problems finally goes away. Your wrist pain will be gone so you can lift your child up without wincing in pain. You will be able to see progress in your sports and strength training because you’ll no longer be hindered by the aggravating pain in your wrist, every time you use your hands. Many people have issues with Wrist Pain either consistently or off and on over the course of years. Wrist Pain can be so frustrating, because sometimes it seems like it just won’t go away! I bet you have heard all kinds of crazy things about how to fix wrist pain. Question: I have been told that I need to strengthen my wrists in order to fix the injury. Will I get better if I just do some strengthening exercises? Strengthening your wrist is important but weakness may not be the only thing you need in order to fix your wrist pain. You may also need to eliminate the tension in your wrist, stretch and lengthen the muscles and even improve your mobility. In our program, Rick and I lay out the complete process for healing the wrist injury, and for keeping it from coming back. This requires the proper activities to be done in the right sequence and with the right progressions. Question: I was surfing around the internet and found a bunch of wrist and lower arm exercises. Can’t I just do these to feel better? There is a lot of stuff on the internet when it comes to wrist pain. The problem is finding complete information on wrist pain from reliable sources. What you will usually find is incomplete programs focusing on just one or two components of a wrist pain recovery program. There are still many other areas that need to be addressed in order to create a successful wrist pain program. Doing the exercises you find on the internet might lead toward your wrist feeling better for a little while but the pain will be back again because most exercise programs are missing the other key components. What you’ll also find is unreliable sources of shoddy information. These are often fly-by-night marketers who read a book over the weekend and think they are masters at curing wrist pain. That is not what Rick and I are about – we want to get you the information we have been developing for years in order to help you get back to normal and keep wrist pain from coming back ever again. Question: I have a bunch of exercises that I got for Wrist Pain from someone else. Shouldn’t these work for me just as well? The problem with doing whatever exercise you find is often key components of an effective wrist injury program are left out and forgotten. Common areas that are missed are volume, or doing the correct amount of work, therapeutic measures, such as relieving built up tension in the soft tissues, and proper stretching practices. These are all important for ending the suffering that wrist pain gives you, and must all be done properly for the best, long-lasting results, but most programs leave these out altogether. On top of all that, even simple concepts like the order that exercises are done as well as progressions, can take an other-wise decent program and make it not only ineffective for you, but also make you worse. We learned a long time ago that the amount of work you do for your wrist pain is just as important as the kinds of exercises you do. We have included only the exercises we consider to be essential to the process of fixing your wrist pain in order to bring it back to a healthy, stable, and strong state again. The best thing about our program, Fix My Wrist Pain, is that you will gain instant access once you pick up the program. And that is because Fix My Wrist Pain is a digital product. The Fix My Wrist Pain Program is an Ebook. Ebook is short for electronic book, a document you read from your PC, Computer, or other electronic device. You download it to the device and you are able to read it whenever and wherever you like. Question: Do I have to buy a bunch of expensive gadgets and gizmos in order to use the Fix My Wrist Pain System? That depends. Most of the equipment used in the ebook are basic items found in most gyms. Others can be found in your home or in your garage. For instance, we will show you how you can use a simple item like a broom to strength your wrist. We do show some specialized equipment that you can buy if you want to, but they are not necessary to the success of your program. Question: Why do so many people prefer to learn with an Ebook, like Fi My Wrist Pain? You get the Fix My Wrist Pain Program right away, and you’re able to access it in minutes and begin implementing it TODAY. Within seconds of placing your order, you will get access to the Fix My Wrist Pain, and be able to start digging in. In 7 days, if you don’t feel a decrease in your Wrist Pain You Get Your Money Back! If that is Not Good Enough, Try the Fix My Wrist Pain Program For The Next 60 Days With A No-Risk, 100% Money Back Guarantee! “Test drive” the Fix My Wrist Pain Program for the next 60 days with absolutely no risk so you can fix your wrist injury and end your wrist pain. You can feel completely safe because you are protected by out iron clad 100% money back guarantee. You will not only be satisfied, I guarantee you will be thrilled and amazed with the Fix My Wrist Pain System, or you can simply email us and ask for a prompt and courteous, no hassles, no questions asked, 100% refund. In fact, if you’re not completely happy for any reason at all, then I insist that you ask for a refund. However, after seeing so many men and women end their Wrist Pain in a quick and effective manner, I am confident that you will be thrilled as well. P.S. – There is NO RISK at all for you when you try the Fix My Wrist Pain System. If you are not thrilled with how this system decreases your pain, let us know and we will refund your order. Your satisfaction is 100% guaranteed. Rick Kaselj and Jedd Johnson have been trusted by the largest fitness & rehabilitation associations in North America (NSCA, ACE, CanFitPro, BCRPA, BCAK, CKA, NHPC and RKC). P.P.S – If you are sick and tired of not knowing what to do about your nagging wrist pain, now you can find out. CLICK HERE to End Your Wrist Pain for Good. P.P.P.S. – There’s only one catch to all this. You need to act now to get the complete package. We’ve been told this package is way too cheap now and the price will be going up very soon. NOTE: The Fix My Wrist Pain System is a downloadable video and e-book. No physical products will be shipped. After you order, you will get INSTANT ACCESS to download the video and e-book. The e-book format is adobe acrobat PDF, which can be viewed on Mac or PC. The video format is M4V which can be viewed on Mac or PC. If you have any questions or need help, you can contact us at support (at) ExercisesForInjuries.com.